An earlier post, "Big Data the Big Hassle," waxed negative. So let me now give credit where credit is due. What's true in time-series econometrics is that it's very hard to list the third-most-important, or even second-most-important, contribution of Big Data. Which makes all the more remarkable the mind-boggling -- I mean completely off-the-charts -- success of the first-most-important contribution: volatility estimation from high-frequency trading data. Yacine Ait-Sahalia and Jean Jacod give a masterful overview in their new book, High-Frequency Financial Econometrics. What do financial econometricians learn from high-frequency data? Although largely uninformative for some purposes (e.g., trend estimation), high-frequency data are highly informative for others (volatility estimation), an insight that traces at least to Merton's early work. Roughly put: as we sample returns arbitrarily finely, we can infer underlying volatility arbitrarily well. Accurate volatility estimation and forecasting, in turn, are crucial for financial risk management, asset pricing, and portfolio allocation. And it's all facilitated by by the trade-by-trade data captured in modern electronic markets. In stressing "high frequency" financial data, I have thus far implicitly stressed only the massive time-series dimension, with its now nearly-continuous record. But of course we're ultimately concerned with covariance matrices, not just scalar variances, for tens of thousands of assets, so the cross-section dimension is huge as well. (A new term: "Big Big Data"? No, please, no.) Indeed multivariate now defines significant parts of both the theoretical and applied research frontiers; see Andersen et al. (2013). 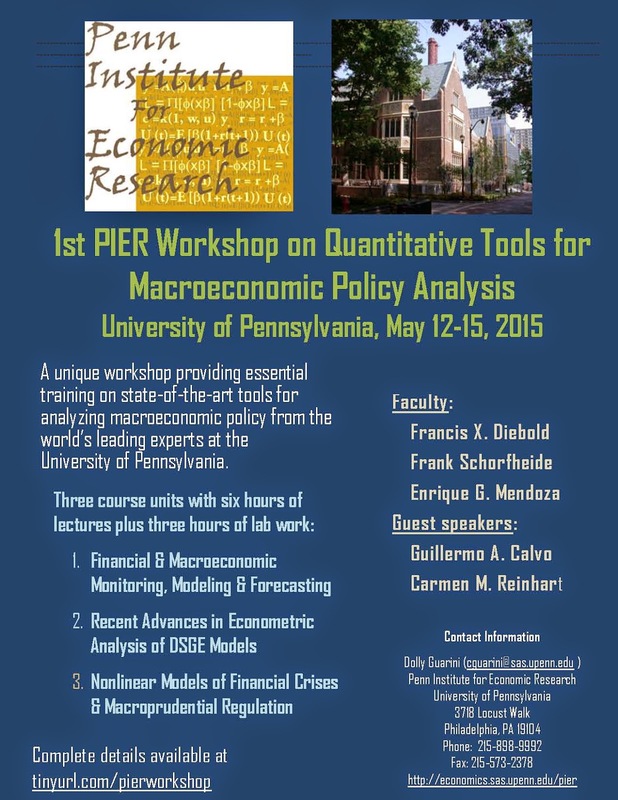 Penn's First Annual PIER Workshop on Quantitative Tools for Macroeconomic Policy Analysis will take place in May 2015. The poster appears below (and here if the one below is a bit too small), and the website is here. We are interested in contacting anyone who might benefit from attending. Research staff at central banks and related organizations are an obvious focal point, but all are welcome. Please help spread the word, and of course, please consider attending. We hope to see you there! Locals who come to the Friday research/reading group will obviously be interested in this post, but others may also be interested in following and influencing the group's path. The schedule has been online here for a while. Starting now, it will contain not only paper titles but also links to papers when available. (Five are there now.) We'll leave the titles and papers up, instead of deleting them as was the earlier custom. We'll also try to post presenters' slides as we move forward. Don't hesitate to suggest new papers that would be good for the Group. I owe an immense debt of gratitude to Larry Klein, who helped guide, support and inspire my career for more than three decades. Let me offer just a few vignettes. Circa 1979 I was an undergraduate studying finance and economics at Penn's Wharton School, where I had my first economics job. I was as a research assistant at Larry's firm, Wharton Econometric Forecasting Associates (WEFA). I didn't know Larry at the time; I got the job via a professor whose course I had taken, who was a friend of a friend of Larry's. I worked for a year or so, perhaps ten or fifteen hours per week, on regional electricity demand modeling and forecasting. Down the hall were the U.S. quarterly and annual modeling groups, where I eventually moved and spent another year. Lots of fascinating people roamed the maze of cubicles, from eccentric genius-at-large Mike McCarthy, to Larry and Sonia Klein themselves, widely revered within WEFA as god and goddess. During fall of 1980 I took Larry's Wharton graduate macro-econometrics course and got to know him. He won the Nobel Prize that semester, on a class day, resulting in a classroom filled with television cameras. What a heady mix! I stayed at Penn for graduate studies, moving in 1981 from Wharton to Arts and Sciences, home of the Department of Economics and Larry Klein. I have no doubt that my decision to stay at Penn, and to move to the Economics Department, was heavily dependent on Larry's presence there. During the summer following my first year of the Ph.D. program, I worked on a variety of country models for Project LINK, under the supervision Larry and another leading modeler in the Klein tradition, Peter Pauly. It turned out that the LINK summer job pushed me over the annual salary cap for a graduate student -- $6000 or so 1982 dollars, if I remember correctly -- so Larry and Peter paid me the balance in kind, taking me to the Project LINK annual meeting in Wiesbaden, Germany. More excitement, and also my first trip abroad. Both Larry and Peter helped supervise my 1986 Penn Ph.D. dissertation, on ARCH modeling of asset return volatility. I couldn't imagine a better trio of advisors: Marc Nerlove as main advisor, with committee members Larry and Peter (who introduced me to ARCH). I took a job at the Federal Reserve Board, with the Special Studies Section led by Peter Tinsley, a pioneer in optimal control of macro-econometric models. Circa 1986 Larry had more Ph.D. students at the Board than anyone else, by a wide margin. Surely that helped me land the Special Studies job. Another Klein student, Glenn Rudebusch, also went from Penn to the Board that year, and we wound up co-authoring a dozen articles and two books over nearly thirty years. My work and lasting friendship with Glenn trace in significant part to our melding in the Klein crucible. I returned to Penn in 1989 as an assistant professor. Although I have no behind-the-scenes knowledge, it's hard to imagine that Larry's input didn't contribute to my invitation to return. Those early years were memorable for many things, including econometric socializing. During the 1990's my wife Susan and I had lots of parties at our home for faculty and students. The Kleins were often part of the group, as were Bob and Anita Summers, Herb and Helene Levine, Bobby and Julie Mariano, Jere Behrman and Barbara Ventresco, Jerry Adams, and many more. I recall a big party on one of Penn's annual Economics Days, which that year celebrated The Keynesian Revolution, Larry's landmark 1947 monograph. The story continues, but I'll mention just one more thing. I was honored and humbled to deliver the Lawrence R. Klein Lecture at the 2005 Project LINK annual meeting in Mexico City, some 25 years after Larry invited a green 22-year-old to observe the 1982 meeting in Wiesbaden. I have stressed guidance and support, but in closing let me not forget inspiration, which Larry also provided for three decades, in spades. He was the penultimate scholar, focused and steady, and the penultimate gentleman, remarkably gracious under pressure. A key point, of course, is that it's not about what Larry provided me, whether guidance, support or inspiration -- I'm just one member of this large group. Larry generously provided for all of us, and for thousands of others who couldn't be here tonight, enriching all our lives. Thanks Larry. We look forward to working daily to honor and advance your legacy.